I recently had an extraordinary experience while I was doing lectio divina on Jesus stilling the storm (Matthew 8:23-27). In that scene, I usually find myself riveted on the moment that Jesus says “Peace, be still” and everything calms down (Mark 4:39). But this time I found myself fascinated by what Jesus’ face might have looked like before he stilled the storm. Jesus had been asleep. As my friend Dallas says, he would have been very relaxed. 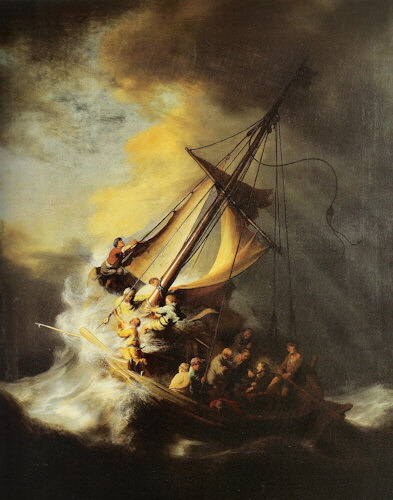 So I saw this strangely relaxed face of Jesus in the midst of deathly chaos – howling wind, people yelling, waves rolling, water rushing into the boat, feet wet from the water filling the boat, people pulling on him to wake up. Maybe I was riveted there because I would like to be relaxed in the midst of chaos – organizational chaos when no one knows what’s going on, emotional chaos when I can’t sort things out, physical chaos when my body is aching for some reason. I wanted whatever it was Jesus had that made him relaxed. Then I began recalling favorite phrases from The Spirit of the Disciplines that revealed why Jesus could be relaxed. So I imagined Jesus’ face and considered that: Jesus was relaxed because spirituality is matter of connecting with another reality. Jesus was relating to and functioning in harmony with this spiritual reality. He never lived “on his own.” His faith in God was a powerful life force (like the force of the wind). He had trained himself to live on the life of God even in a physical, quite drownable human body. He had the vitality and power and energy of the Kingdom of God in him. He was truly alive to the Kingdom of God. This gave him a force of a higher life. In short, he lived in experiential union with God. At that moment, he exhibited the kind of life you and I are invited to live–alive in the Kingdom of God, in harmony with spiritual reality. If you wish, reflect on this using this Rembrandt painting. You’ll notice the chaos on the left first, but look to the right to the seated, relaxed Jesus with his face turned toward the storm. How does his relaxed manner make you feel? Does he have what you want? Where are the storms in your life where you want to rely on God? What would you like to say to Jesus? What specifically do you want to say to him about this powerful reality in which he is inviting you to live?